One of my favorite parts of Lake Charles is the downtown area. I adore all of the boutiques, music hotspots, and of course, the downtown restaurants! What can I say? I’m a sucker for a good meal. Every once in a while I treat myself to a really decadent dish. Luna Bar and Grill’s Fish Apollo hits the spot. 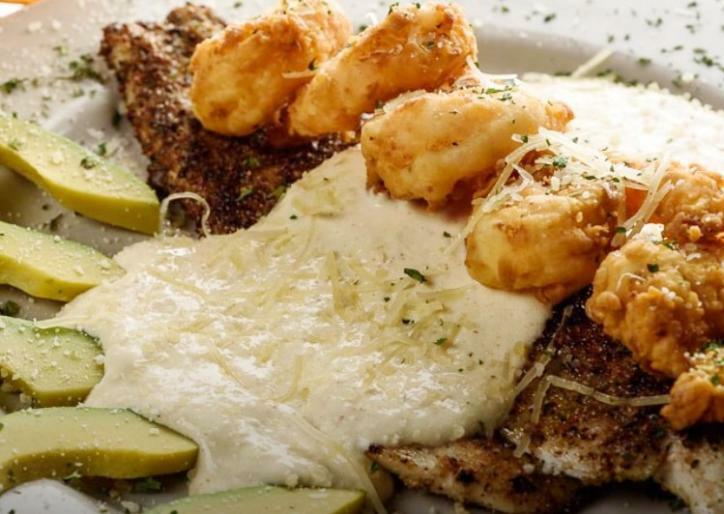 You get all the richness of cheeses and heavy cream mixed with the fresh and tender flavors of local seafood: shrimp, crab and redfish fillets. It’s always the RIGHT choice to visit the restaurant and enjoy a night on the town, but when you’re not in Southwest Louisiana, here is the recipe for you to try at home. Click here to download the recipe card. Preheat oven to 200 degrees. In a small saucepan, heat oil over medium-high heat until a candy or deep-fry thermometer reads 350 degrees. In a medium bowl, stir together milk, eggs, 1 teaspoon salt, garlic and cayenne. Place flour into a shallow dish. Coast shrimp in egg mixture, then in flour. Fry shrimp in hot oil in batches for about 4 minutes or until golden brown. Place shrimp onto a paper towel lined baking sheet and keep warm in the oven. Sprinkle fish fillets with remaining 2 teaspoons salt and Creole seasoning. In a large skillet, heat olive oil over medium-high heat. Add fish, and cook about 4 minutes per side or until browned and opaque through the thickest part. Spoon Crab Au Gratin Cream Sauce onto the bottom of a large platter, and top with fish and shrimp. Garnish with Parmesan, if desired. In a large skillet, melt butter over medium-high beat. Add onion and garlic; cook about 5 minutes or until onions brown. Reduce heat to medium-low, and stir in crabmeat, cream cheese, and Parmesan; cook about 6 minutes or until cream cheese melts. Whisk in cream, salt, and pepper and cook until sauce is thoroughly heated. For more fantastic dining options, check out our Top 20 Restaurant list. For a full list of downtown restaurants, click here.